The Giant Inflatable Soccer Ball is the King Kong of blow-up toys. This soccer ball is 6 foot tall. Everywhere you take this gargantuan soccer ball, heads are going to turn. The Giant Inflatable Soccer Ball can handle its fair share of swift kicks. At over 475 times larger than a regulation soccer ball, the Giant Inflatable Soccer Ball ensures your have tons of fun. 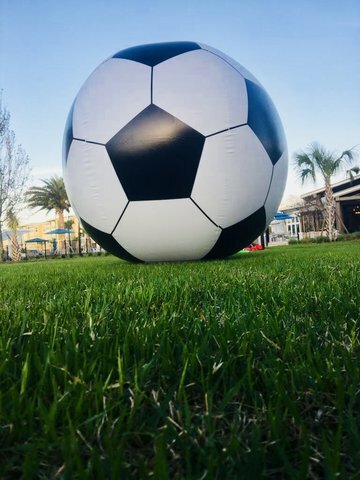 Rent our giant inflatable soccer ball for your event.